The Kara-Suu District Court in Osh Region completed a trial of the case of Rashod Kamalov, a popular imam at the As-Sarakhsi mosque, on October 7. Mr Kamalov is charged with three crimes, each of which fell under two articles in the Kyrgyz crime code: inciting religious animosity, abuse of power, and distributing extremist materials during mass events. “The judge found Rashod Kamalov guilty in accordance with two articles of the country’s crime code: Article 299 and Part 1 of Article 299, and sentenced him to five years of imprisonment in a penal colony,” Valeryan Vakhitov, Mr Kamalov’s lawyer, has told Fergana. According to the Turmush.kg online portal, the judicial proceedings established the fact that the local mufti’s office did not issue an order to appoint Mr Kamalov imam of the As-Sarakhsi mosque in the town of Kara-Suu. The judge accepted the argument and restated the charges by removing the aggravating condition of “by abusing power” on all three counts. The judge has also took into consideration such circumstances as the absence of the defendant’s previous convictions, family and positive feedback from public. Indeed, Osh Regional Kadhi’s Office (the regional office of the general mufti’s administration) reported immediately after Mr Kamalov’ detention in February that he is not an officially assigned imam of the As-Sarakhsi mosque. “He was allowed to continue serving as imam to avoid the parish’s discontentedness. There is no official document issued to this effect though. We are unable to comment on his activities, but can report that Rashod Kamolov was not imam officially,” Osh Region Kadhi Niyazaly Aripov told Fergana. Reshod Kamolov became the imam of As-Sarakhsi Mosque following the murder of his father—Muhammadrafiq Kamalov, then-imam at As-Sarakshi—in August 2006. Kamalov Senior was one of the most influential theologians among “Islamic reformers” in the region. Judge Koychubek Jobonov presided over the case, while Azam Satyvaldiyev and Nurlan Abdrazkov, two prosecutors at the Kara-Suu district prosecutor’s office, spoke on behalf of the government the case and Nazgul Suyunbayeva, Valeryan Vakhitov and Husanbay Saliyev represented the imam’s interested in court. A total of 17 hearings took place over the four months of the Kamalov trial with each lasting for several hours. The lawyers provided over 20 solicitations, the majority of which were accepted; seven eyewitnesses as well as ten experts and specialists testified during the trial that was filed in five volumes. Background: Mr Kamalov was arrested on February 9. The prosecutors charged for his statements recorded in a compact disk that was provided by a local Kara-Suu resident; the prosecutors then levelled more charges based on a compact disk found in his house during a search; the third round of charges was levelled based on a video recording available online. In all three sources, Mr Kamalov is seen and heard preaching about the notion of a caliphate and explaining its essence. Mr Kamalov was initially arrested for two months. The detention term was extended several times during subsequent hearings. Mr Kamalov has told the trial participants that he was delivering a Friday sermon when he was explaining the meaning of the word “caliphate” on 4 Jul 2014. This explanation was then distributed on disks and online. Mr Kamalov has told the judges that many, especially young people, asked him questions about the caliphate, the war in Syria and the so-called “Islamic State” on that day. Speaking as an official cleric of the main mosque in Kara-Suu, Mr Kamalov cited the Koran and hadiths in his sermon. According to the defendant, he said the youth must not travel to Syria and that doing so would contract the constitution of Kyrgyzstan. “I did not urge anyone to take to streets or overthrowing the government. The concept of caliphate is found in the Koran and hadiths,” the imam stated. Mr Kamalov wrote a letter in May to Kyrgyz President Almazbek Atambayev, asking him “to nip the involvement of specific law-enforcement agents, who are using their office in an attempt to punish me.” The defendant imam has also stated an entire information campaign was unfolded to mar his name and that “violated the benefit of the doubt” concept. The experts that provided findings based on their research of his sermons do not have education in religion and do not speak the Uzbek language, which the sermons were made in. Further, the State Commission for Religious Issues is “not a forensic expert organisation,” which did not stop it from issuing a negative conclusion. 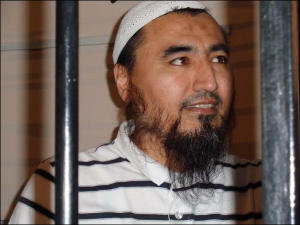 Lawyer Vakhitov told Fergana the defence team was planning to appeal the verdict.